A new quantitative polymerase chain reaction (qPCR) test can quickly detect and quantify S. sclerotiorum DNA with a high level of sensitivity and specificity. This DNA test of canola petals could provide canola producers with an assessment of sclerotinia spore load without the three- to five-day waiting period required for the current petal test. 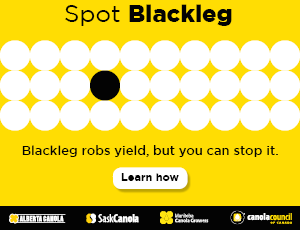 If proven to work, a qPCR risk assessment tool can assist canola producers in making informed spray decisions and reduce non-economic fungicide application. Kelly Turkington with Agriculture and Agri-Food Canada (AAFC) led the three-year study to develop a rapid, qPCR-based method for detection of Sclerotinia sclerotiorum DNA in canola flowers. This can be related to actual disease levels across the Prairie canola growing region. S. sclerotiorum DNA on flower petals (estimated with qPCR) and final stem rot levels in commercial fields. The strength of the statistical relationship will determine whether qPCR estimates of petal infestation levels are a good indication of final disease incidence. Researchers also want to determine if this method can be deployed in private seed testing labs with qPCR capabilities for commercial use. Early and late bloom samples were collected from fields in Saskatchewan, Manitoba and Alberta in 2010, 2011 and 2012, and from central Alberta in 2013. They are currently being assessed using qPCR. Final disease incidence and severity were recorded in the same fields and will be used to determine the relationship between qPCR results and stem rot disease incidence/severity. In approximately a third of the fields, the average percentage petal infestation with S. sclerotiorum was also assessed using an agar plate procedure. Typically 200 petals were plated per field and presence of S. sclerotiorum was assessed after three to five days. The agar plate test results will be used to statistically determine the correlation between qPCR results and the traditional method for estimating petal infestation levels. Petal testing and final disease results will be compared with environmental data and results from weather-based forecasts to determine the potential for use in practical integrated stem rot forecasts. The study shows that the developed qPCR assay is able to detect and quantify S. sclerotiorum DNA from field collected canola petals with a high level of sensitivity and specificity. An internal control has been included to control for false negatives. Field petals collected are currently being analyzed to determine the relationship between qPCR results and final disease incidence, which will determine the potential for this assay to serve as a risk assessment tool.